July 1, 1863, Emmitsburg, MD. – The higher the sun rose in the sky that morning, the more impatient Col. Ira Grover became with his regiment’s overdue relief. 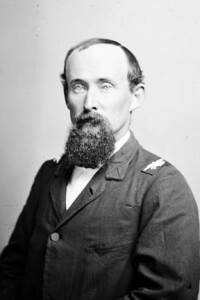 Finally, at 10 a.m., he ordered his 7th Indiana to move north to rejoin the main army. On the march, Grover heard that fighting had broken out at Gettysburg and quickened the pace. Arriving that evening, his men were posted to Culp’s Hill. Historians note that Grover’s decision had two results. First, it saved Culp’s Hill from being captured by Edward “Allegheny” Johnson’s division later that night. Second, it resulted in Grover being hauled before a court martial just after the battle and charged with leaving Emmitsburg, MD without orders. Or did it? Jim discussed the court martial—including the fact that it had nothing to do with his departure from Emmitsburg. He explained how historians confused Grover’s court martial with his July 1 march, the events leading up to Grover’s court martial, his unusual but successful defense, and, of course, how the 7th Indiana saved Culp’s Hill that first night of July. Jim Heenehan has been a member of Old Baldy for ten years. Jim has been an attorney for the United States Environmental Protection Agency since 1978. 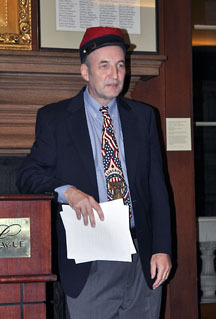 He has written several articles for various Civil War publications, the most recent being his piece on the Philadelphia Brigade at Pickett’s Charge for The Gettysburg Magazine. This entry was posted in Meeting archive on September 9, 2010 by hlj.